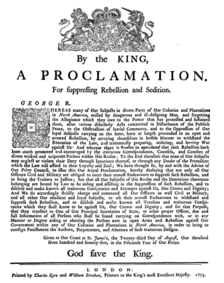 A 1775 printing of the Proclamation. 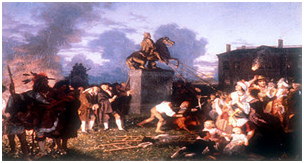 The Proclamation of Rebellion, officially titled A Proclamation for Suppressing Rebellion and Sedition, was the response of King George III of Great Britain to the news of the Battle of Bunker Hill at the outset of the American Revolutionary War. 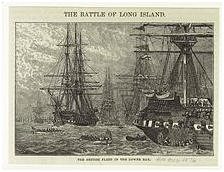 British troops in the type of flat-bottomed boat used for the invasion of Long Island. 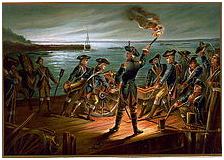 Hessians, in their blue uniforms, are in the two boats that are only partly visible. 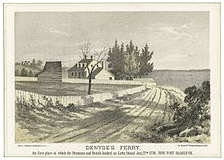 Denyse’s Ferry, the first place at which the Hessians and British landed on Long Island August 22, 1776 by A. Brown. 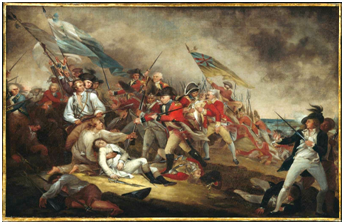 This high-point overlooking the Narrows was an American artillery position and was bombarded by the British before the invasion, but the actual landing took place further east at Gravesend Bay (around to the left from the perspective of this illustration) where the conditions were more favorable for the small British boats carrying the troops. 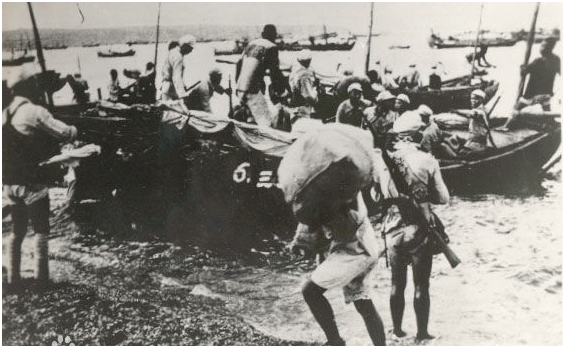 American strategy called for the first line of defense to be based on the Heights of Guan - a series of hills which stretched northeast across King’s County. 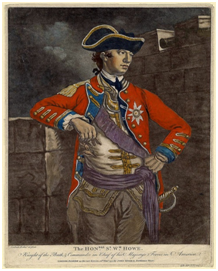 The main defensive works – a series of forts and entrenchments – were located in the northwest of the county in and around the Dutch-founded town of Brookland. 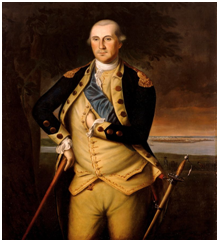 The “Road to Narrows” is the Gowanus Road. No. 5 is the “Old Stone House“. 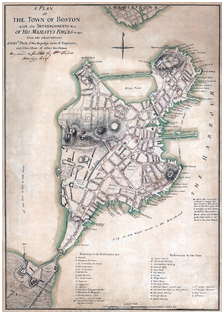 Map by Bernard Ratzer based on his 1766-1767 survey. 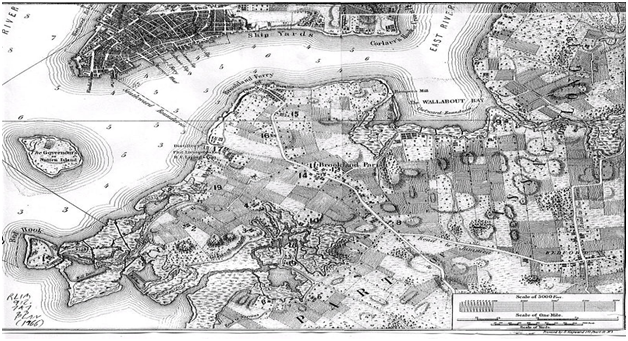 Map showing Howe’s attack upon Washington’s forces on Long Island. 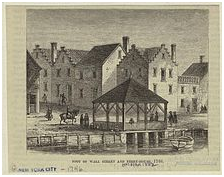 Howard’s Tavern as it appeared in 1776; it was demolished in 1880. 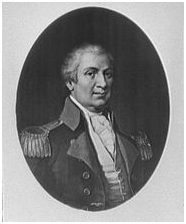 The tavern was located near the present-day intersection of Fulton Street and Jamaica Avenue. 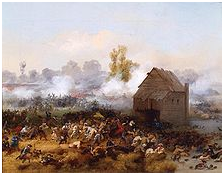 Battle Pass – also known as “Flatbush Pass” – is located in modern-day Prospect Park. 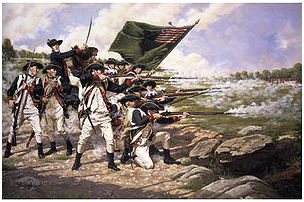 Here General Sullivan and his troops were out flanked by the British who attacked from the rear while the Hessians attacked up Battle Pass. 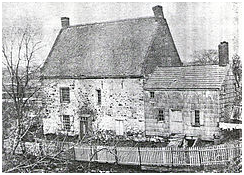 The front of the original Vechte-Cortelyou House (built c.1699); where the Maryland troops commanded by Lord Stirling and Mordecai Gist made two attacks against over two-thousand British troops in a rear-guard action that allowed a majority of Stirling’s 1,600-strong command to escape. The house was reconstructed with original materials in 1937 after a fire.